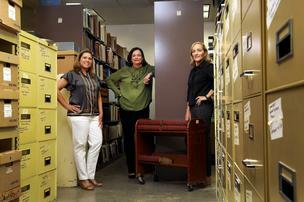 From left, Texana/Genealogy Initiative Co-Chairs Mari Tamez and Ruth Agather, along with San Antonio Public Library Foundation President Tracey Bennett, stand in the vault that archives books, microfilms, maps and other types of historical information. Public libraries are not merely places where books are housed. They are places of social equity that knit the community together via shared resources and opportunities. And the San Antonio Public Library Foundation aims to help the city-funded public library system, with 30 branch libraries, live up to that ideal. The Library Foundation was established nearly 35 years ago as a 501(c)(3) charitable organization by local business and civic leaders to enhance the public library system’s offerings, she said. Entering her 22nd year with the organization, Bennett and her 70-member board work diligently with Library Director Ramiro Salazar to augment the San Antonio Public Library’s budget with support from several sources, including individuals, corporations and charitable foundations. Known for successful efforts such as the San Antonio Book Festival and the Latino Collection and Resource Center, the Library Foundation’s newest initiative is the Texana/Genealogy Department housed within downtown’s big red Central Library. It’s a well-kept secret for some Library patrons — but not for long. Occupying 10,000 square feet on the library’s sixth floor, it holds roughly 75,000 books, 60,000 microforms, 110 drawers of archival files, 11 map cabinets and more than 300 cubic feet of archival collections including 18th-century paintings of the historic missions, a page from a Guttenberg bible, the African-American Funeral Programs Collection, and maps and demographic information from the city’s earliest days. Texana also provides free access and assistance for people seeking Ancestry.com information about their heritage. Mari Tamez, a petite brunette with intense brown eyes, is a longtime enthusiastic Library Foundation board member who has served in many leadership roles over the years. She said the two most important institutions preserving the nation’s cultural heritage for its citizens are its libraries and universities. Tamez, co-chair of the Texana/Geneology Initiative, is a Canary Island decendent and extensively utilized the Texana collection of historical records to research her family’s history and settlement in San Antonio. “With the city celebrating its tricentennial and a renewed interest in the history of our community, we felt it was a great opportunity to begin transforming the Central Library’s sixth floor into a fantastic special collection resource center,” she said. The Library Foundation’s “Let the Legacy Continue” campaign is a $1.3 million fundraising effort that will enable the organization to create a cutting-edge center that will be a cultural destination. The Library Foundation, with its four-person staff, depends on passionate volunteers like Tamez and Texana/Geneology Initiative co-chair Ruth Agather to evangelize the power of libraries and encourage monetary support. In May, due to these volunteers’ advocacy and other voices, city voters approved a bond proposition to fund a $700,000 partial renovation of the Texana/Genealogy area. The money, along with $1.3 million that the Library Foundation has pledged to raise from private contributions, will be used to renovate the existing vault with a new climate control system, implement best professional practices through other fixtures and equipment that enable proper archiving and preservation of rare and valuable materials, and activate efforts to facilitate better public access to these materials. In the fall, Bennett said, the Library Foundation will host a “Texana White Glove Reception,” where attendees will have the chance for a behind-the-scenes tour inside the vault — and be invited to support its renovation. For more information, go to www.saplf.org.